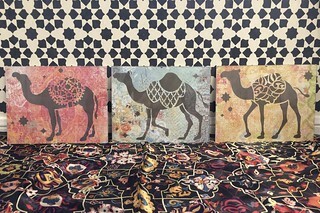 A trio of hand-stenciled, patterned camels. 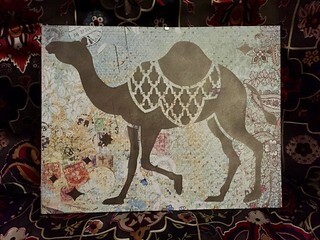 Each camel is stenciled in a dark bronze metallic paint on heavy, decorative paper and is mounted in a ready-to-hang, 8.5"x11" clip frame. Hang together as a herd or spread the cameliciousness around your home! Raffle is open to all Brats, not just reunion attendees! Tickets are $5 each. You may purchase as many raffle tickets as you want. Each ticket will give you one opportunity to win. Drawing will occur shortly after cut-off date. If your name is drawn, you will be notified via email. If your contact information is not valid, or you do not confirm receipt within 48 hours, the prize will be assigned to the next name drawn. This item will be shipped to the winner.